Looking forward to cleaning the church floor! 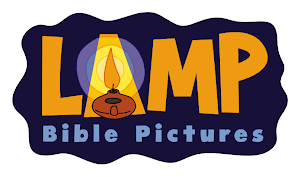 A couple of Sunday School Passover activities - totally unseasonal, I know, but I've just finished my Passover illustrations, and I want to make a Pinterest board. 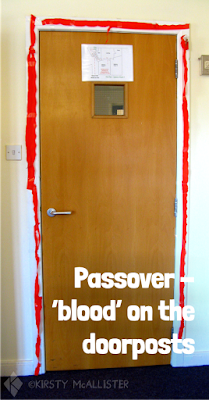 At the appropriate point in the story, we taped crepe paper 'blood' round our door (unfortunately the inside, as there's another class outside). 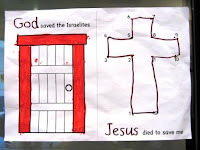 Each child got a torn strip and they took turns to add it to the door. This did take a wee while, as only one or two could do it at a time, and the higher pieces involved standing on chairs or lifting the children up. Then we had a 'Passover meal'. Food at SS is always a Good Thing. I concentrated on the three foods specifically mentioned in Exodus. Lamb This is an unfamiliar food to many small children (Yuk), so using lamb burgers made it more accessible. Non-minted would have been better, but it was all I could get. I precooked them the night before and cut them in cubes. Two quarter pounders was just right as a wee snack for about 8 or 9 people. Bread In the past I have used Matzos, but this year was unable to find any large ones. So I got pita bread. I know it's not unleavened, but I couldn't find any unleavened bread - even wraps and chapattis have yeast. 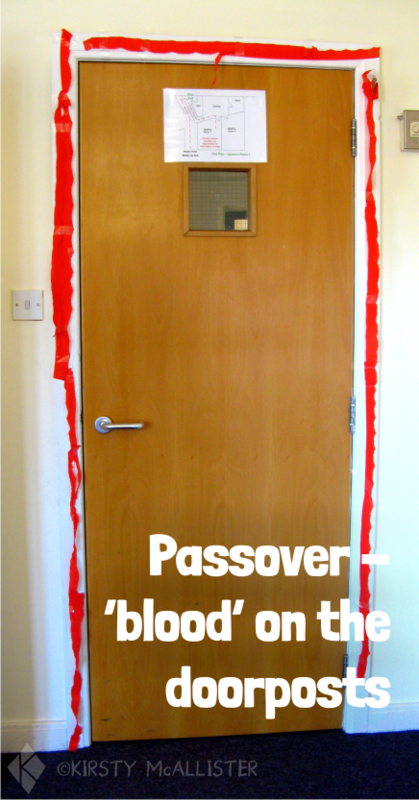 I don't think it really matters in this instance - it's a SS lesson, not a kosher passover. Four mini pitas was just right for 8 or 9 people - everyone got half. Bitter herbs I used watercress. 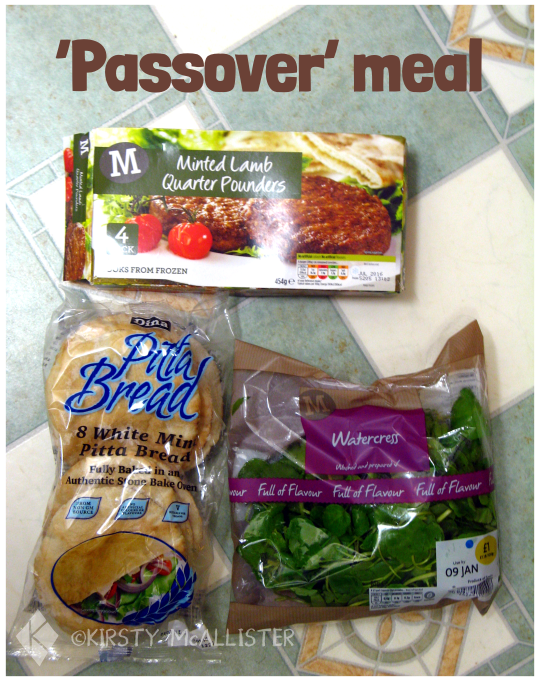 As I just used half of each packet, I froze the pita and lamb burgers for when we did the Last Supper - the syllabus worked out really well this year, as we had both in the same term - I'll see if I can wangle that again, as it really helps with our understanding of both. For the last supper I also added wine (grape juice). 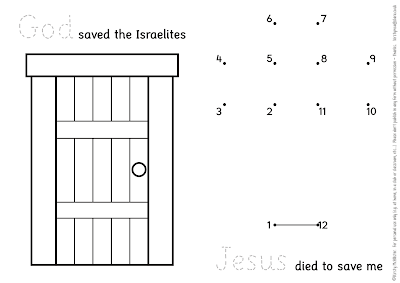 And, finally, here's a simple worksheet. The idea is that they draw blood round the door - not necessarily quite as much as this example! 'That is because you are older, little one,' answered he. 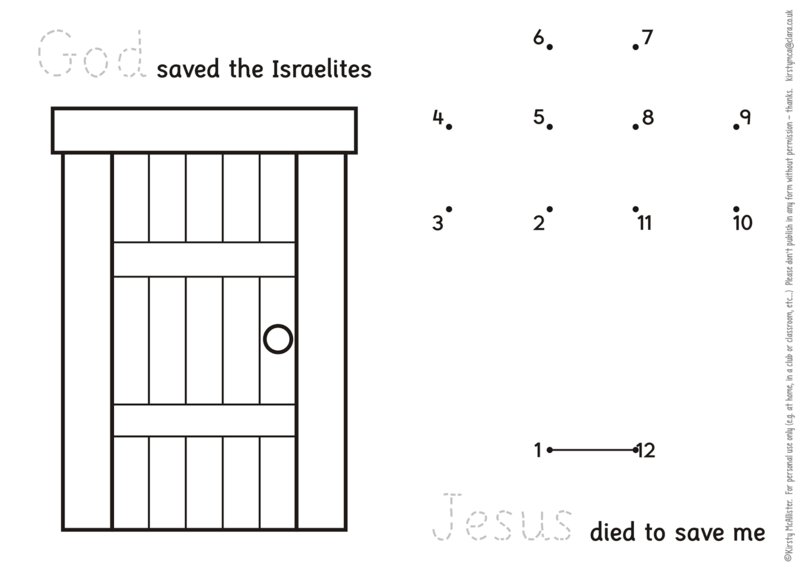 Peter did not feel very brave; indeed, he felt he was going to be sick. But that made no difference to what he had to do. I've just Googled it, and discovered Dolly was born 20 years ago (at which time my friend was six). But to me this is a recent event. If I'm going to invest myself into this, if I'm going to beautify - use my skill to beautify - this message, I need to really make sure that it's a message I want to beautify. This man is from another planet. His ancestors left earth millenia ago, and have developed separately, advancing far beyond us. They can walk through walls and send messages to light years away in a few minutes. They consider quantum physics to be a 'misconception of elementary science'. They call us primitive. He fastens his clothes with a standard zip. in a social anthropological experiment, researchers deliberately bumped into hundreds of people across the country*, and found 80 per cent of people barged into apologised. 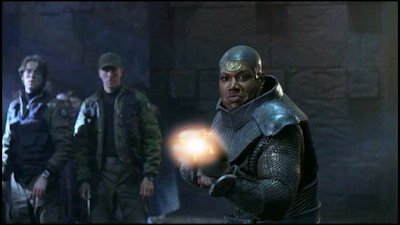 I'm working my way through the first two seasons of Stargate SG1, and was struck while watching episode 16 ('Cor-ai') by the similarities between Teal'c and the apostle Paul (there are of course many dissimilarities too). Some interesting things in there about guilt and forgiveness and repentance. TEAL'C: Hanno's father died by my hand. No one else's. I am responsible. What I did while serving Apophis, I will not hide from. O'NEILL: Even if the punishment is death? TEAL'C: Then that is what I deserve. O'NEILL: Tell us what happened to your wife. O'NEILL: And how did she get to be one of the victims? DANIEL: The leader of the serpent guards picked her out of a crowd of other women, at random, really. O'NEILL: Who was this serpent guard? DANIEL: The OLD Teal'c. At that time, he hadn't joined us yet. He didn't know me or that Sha're was my wife. 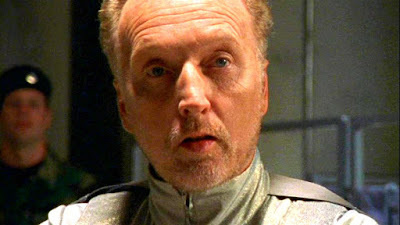 O'NEILL: But the fact is you now work side by side with the man responsible for your wife's fate. JACKSON: It was difficult for me at first; I wanted to hate him. But now I know that it was a different Teal'c that chose Sha're and I know that if there were any way for him to help me get my wife back, this Teal'c would do it gladly. Even if it meant giving up his own life. This Teal'c is my friend. TEAL'C: There were fifty human captives. All were unarmed. Apophis ordered me to slaughter them all. CARTER: But you didn't, did you? CARTER: What did you do? 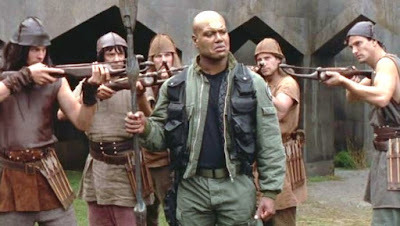 TEAL'C: I turned my weapon on my fellow serpent guards. CARTER: It was a huge risk for you, wasn't it, Teal'c? TEAL'C: I made a decision. HANNO: I have just one question for you. HANNO: Can any of his present or future actions bring my father back from the dead? DANIEL: No, nothing will do that. HANNO: Then obviously no amount of good done in the past or the present will erase the guilt of what he has done. HANNO: You would protect those who want to kill you? TEAL’C: I would protect those who deserve to live. HANNO: I was mistaken. My memory was faulty. You are not he who killed my father. TEAL’C: I am the one. HANNO: No. He is dead. You have killed him. Heart vs Mind: What Makes Us Human? Very interesting programme currently on BBC iPlayer here. Slightly complicated in places as it seems to switch between 'heart' meaning physical organ and 'heart' in the more metaphorical sense - although one of the things it is also exploring is what the connection between those two definitions of 'heart' is. “Even in your world, my son, that is not what a star is but only what it is made of." Sonny from iRobot (the film, not the book). Specifically the scene where they open him up to see what makes him tick.